Ruby had a wonderful weekend filled with corgis, labradoodles, adventurous walks and new stuff. We set out on Friday morning, heading south in my Subaru. Ruby has been getting car sick on a regular basis, so I fed her a very light breakfast several hours before we left. I'm happy to report that we had a vomit-free journey! She donned her Thundershirt which seems to help with her anxiousness and reactivity in the car, and cued up her Through a Dog's Ear CD. We made a quick stop at the farm store to pick up senior feed for my horses, who are boarded out on the eastern plains. Ruby likes to go in to the feed store - there is always someone to say "hi" to, dog chews to choose from, and a cat or two hanging about. She got some bully sticks and some Whimzees alligators, (although I call them "crock-ee-dyles") as well as compliments on her green ensemble. I took her for a little walk at the barn, where she enjoyed sniffing in the tall grass. She is still uncertain about horses, though they really wanted to check her out! She waited in the car while I gave some treats to my Paso Fino gelding, Coro, and my Arabian mare, Notchee. You can see a picture of them here. Our next stop was Infinity Farm, where my friend and former trainer lives with her menagerie of horses, ponies, llamas, goats, ducks and most importantly for the purposes of this story, dogs. 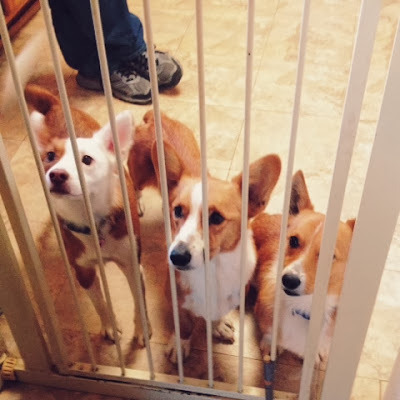 Anna has two rescued corgis in her fantastic care: Walter and Preacher, as well as a labradoodle named Finny who Ruby adores chewing on. This was Ruby and Preacher's first meeting, and they hit it off splendidly, spending hours covering each other in spit. Walter prefers human company and was glad to leave the roughhousing to the other two, although he enjoys policing their antics with his authoritative quacking. Ruby even managed to find some leopard-print slippers for a game of tug-o-war. We reluctantly said our goodbyes as the sun started to set, and left for my aunt's house where Ruby had a second string of dogs to exhaust: my aunt's labradoodle, Hachi, and Aussie/spaniel mix, Stevezey. 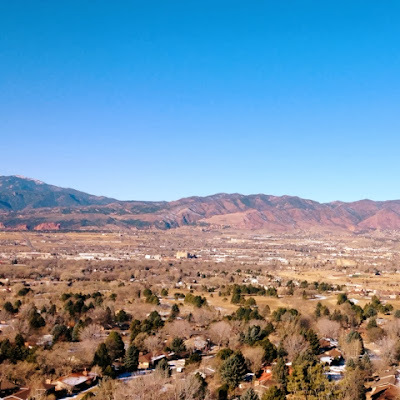 On Saturday morning we loaded the dogs in my aunt's Jeep (Rubicon, appropriately) and took them for a hike in Palmer Park above Colorado Springs. We met several joggers at the trail head and Ruby barked a little. We had the snowy, slippery trail mostly to ourselves, encountering one off-leash husky-mix and a man with a beagle. I picked Ruby up both times since the trail was narrow, and turned her away as they passed. I was quick enough that she hardly noticed the husky, but she did some shrieking about the beagle. The man, who was walking his perfectly well-behaved beagle on-leash, apologized to me! I was stunned and replied that my dog was the one with the problem! On our way back we started seeing a lot of mountain bikers on the trails below, but luckily were only passed by a few. At this point Ruby was pretty riled up and I was happy to get back to the car. She and Stevezey fell asleep on the way home. My aunt and I went out for lunch and some shopping while the dogs stayed with my Grandma. Gram had many dogs over the years and loves seeing Ruby's latest tricks. I needed a new bed for Ruby since there was a hole in her old one (which had been Freya's) and she had started pulling the stuffing out. I found a cute peach bolster bed in her size, as well as a little kitty hut for my cat, Nina. Nina is 17 years old and her favorite place to sleep is by the heat register in my upstairs bathroom, so now she will have a warm, comfy den where no dogs are allowed! Ruby and I had an uneventful trip home until a stop at the grocery store - I had planned to run in quickly but she was barking at people in the parking lot so I did not want to leave her stressed out in the car and opted to take her home first. 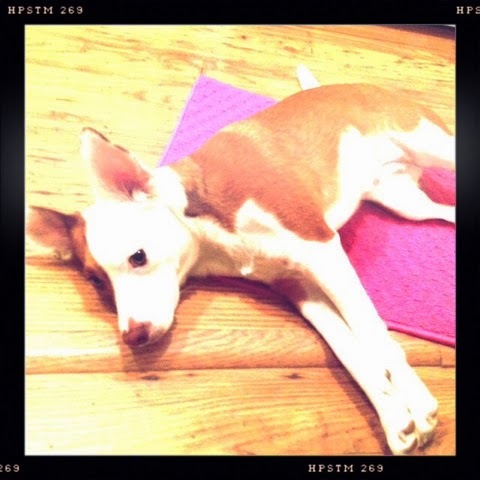 She was exhausted, almost too tired to check out her Hero Dog Box which had arrived! Ruby was very mellow for the rest of Saturday and Sunday, but we went on some short walks, worked on some new tricks, and practiced the Relaxation Protocol. Somewhat discouragingly, we are stuck on only Day 3, but we made some real progress the last few sessions and I think we are close to completing it. She has started laying her head down, and even sometimes laying on her side like her "relax" cue. I have found that I need to be sure she has had some exercise first, and is interested in food but not too hungry. I use her regular kibble as treats for that work - soft or smelly treats are a bit too exciting when the objective is to relax. I was really proud of Ruby this weekend: she met a new dog, went hiking in a busy place, and played nicely with her dog cousins. She is truly happier around other dogs that she knows, and I am moving forward with being a foster for the American Eskimo rescue...more to come on that front soon! 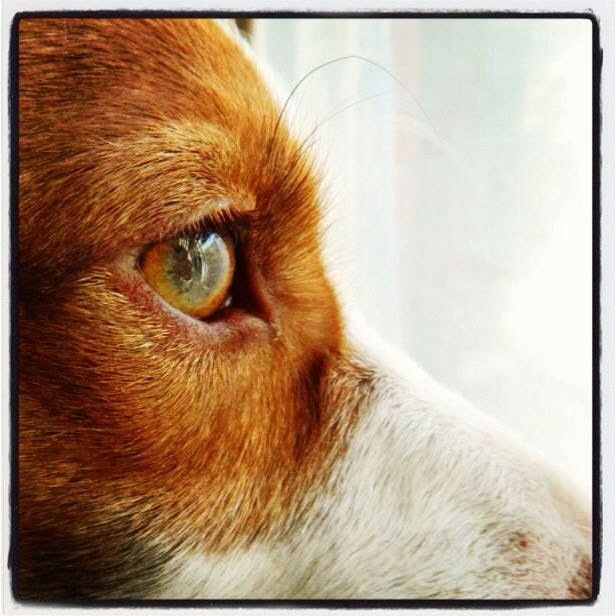 Inspired by the dog book post on My Imperfect Dog yesterday, I thought I would share some of my favorites which have stayed with me over the years. 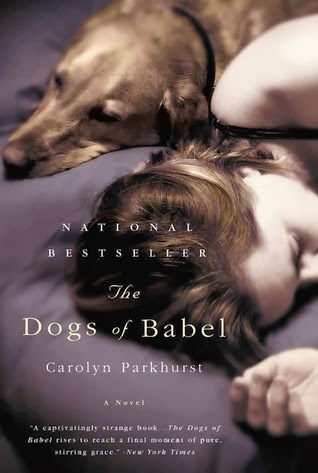 The first is a novel, The Dogs of Babel by Carolyn Parkhurst, which also has a place in my top ten of all categories. I have read it twice, and the melancholy magic of its mystery was not diminished even when I knew the outcome. The book follows a man who tries to piece together the circumstances of his wife's death through attempts to illicit communication with the sole witness: their soulful Rhodesian Ridgeback, Lorelei. It is a beautiful novel about love and loss and the secrets we all keep, and it's one that I can hardly talk about without a lump in my throat. It would be redundant to say that Dog Years is "poetic," since Mark Doty is a prominent contemporary poet. He resides in a world of metaphor, and for that reason he cuts into the difficult, the unsayable, with a blade of revelation. This is so much more than a dog book. We're given glimpses of a human life that is woven into and around the lifetime two retrievers and a through dreams, vignettes and intimate scenes. It portrays the immediacy that dog love demands, the beauty of it at its most basic and wild. 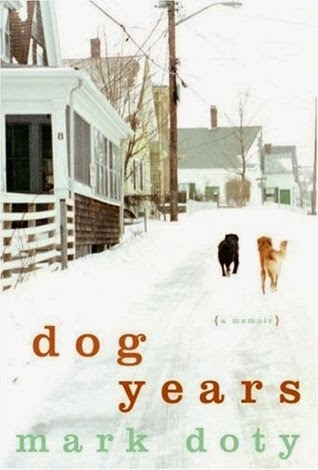 Pack of Two was one of the first dog memoirs that I read, and still one of the most affecting. 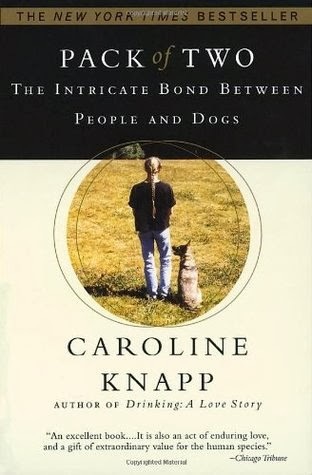 The author, Caroline Knapp, struggled with eating disorders and addiction before getting her German Shepherd, Lucille, and learning how to take care - and be taken care of by - a dog. It's a beautiful journey of healing and friendship, of both the canine and human variety as Knapp meets kindred spirits at the dog park along the way. 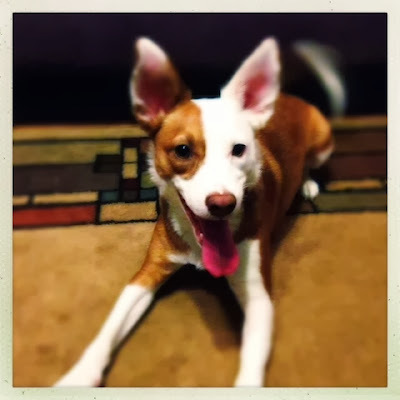 It's the tale of a first dog and the independence and strength they can help us find. I related so much to this book because I adopted Lasya at a time when nothing was stable or certain, but I felt that with her by my side everything would be okay. Tragically, Caroline Knapp passed away at an all-too-young age. Her best friend Gail Caldwell wrote a tribute to their friendship, Let's Take the Long Way Home, and makes mention of their many dog walks together. The New Work of Dogs by Jon Katz is an unsentimental look at the very different lives of twelve dogs in a New Jersey city, from service dogs to shelter dogs. It is a powerful portrayal at the changing role of dogs in society, and suggests that their modern jobs may be more difficult and complicated than we realize. I was lucky enough to meet the author of Part Wild, Ceiridwen Terrill, at a book-signing here in Denver. 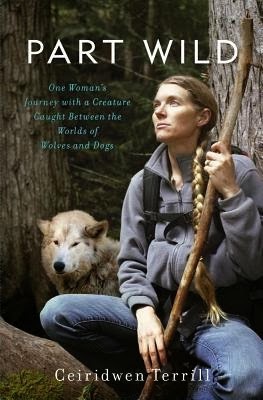 I really admire Terrill's bravery in telling the story of her wolfdog Inyo and illuminating the heartbreak and danger of trying to contain wild animals in human bonds. 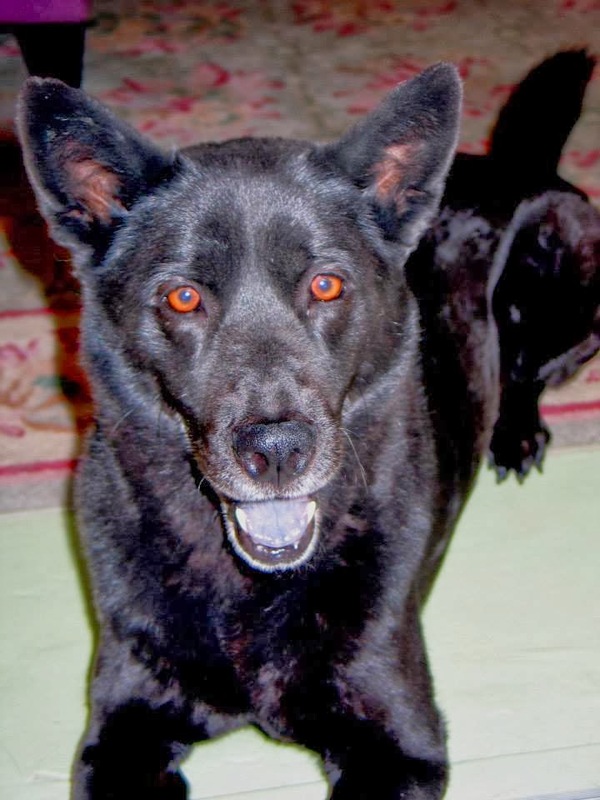 She went farther than personal memoir with a great deal of research into the challenges facing wild wolves, the still-debated origin of domestic dogs, and the "genetic tameness" experiments with foxes in Russia. She is also an accomplished writer and describes nature and its creatures in eloquent detail. While Terrill was drawn in by the fairy tale allure of wolfdogs, she is now an advocate for for legislation and enforcement banning the continued sale and breeding of these animals. This is a compelling and important book emphasizing the differences between wolves and dogs. 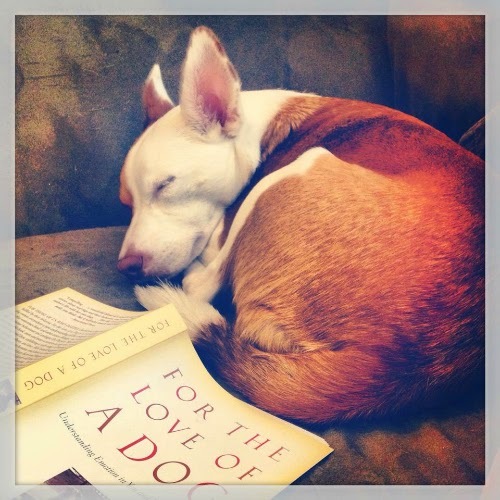 What are some of your favorite dog books? Aside from the dirty window, this is a wonderful sight to come home to every day. 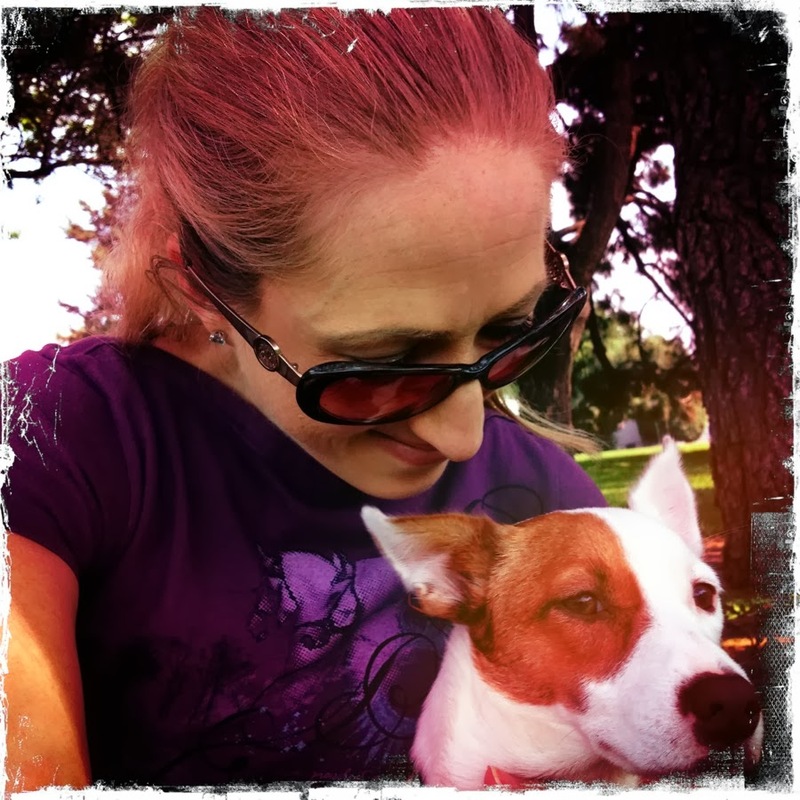 My first inspiration for starting this blog starring my reactive dog came from discovering blogs such as Rescued Insanity, Rollin' With Rubi and My Imperfect Dog. The stories of Shiva, Rubi and Silas made me feel like I was not alone in this world where seemingly every other dog I saw could walk down the street with a happy grin and a wagging tail oblivious to everything that would send Ruby into a volatile blur of red and white. Now several months in and I still haven't gone into a whole lot of detail about Ruby's various issues. I don't even have a tag for it yet! 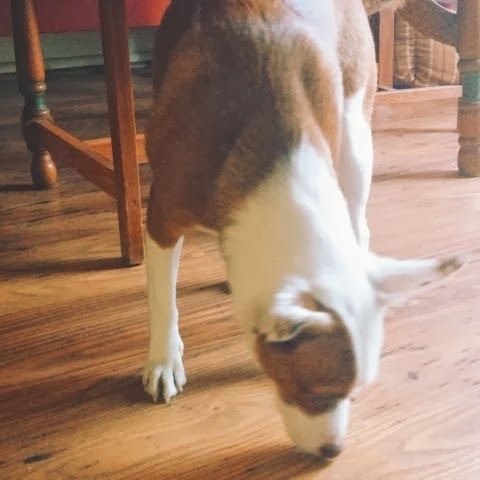 I find that I'd much rather talk about her brilliant mastery of a new trick than her embarrassing freak-out at the cyclist/man walking briskly toward her/dog across the street on our most recent walk. So, I'm here to say: I have a reactive dog. 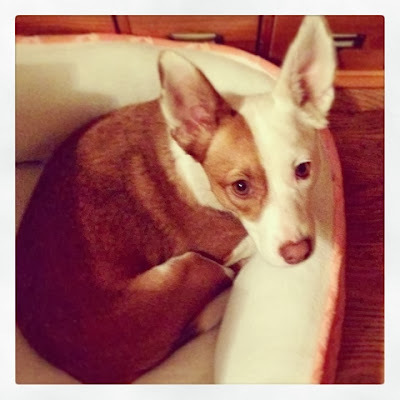 Ruby spins, barks and lunges at dogs, pedestrians, cyclists, skateboards and sometimes cars if she's run out of spoons on-leash, from inside the car and from inside the house. 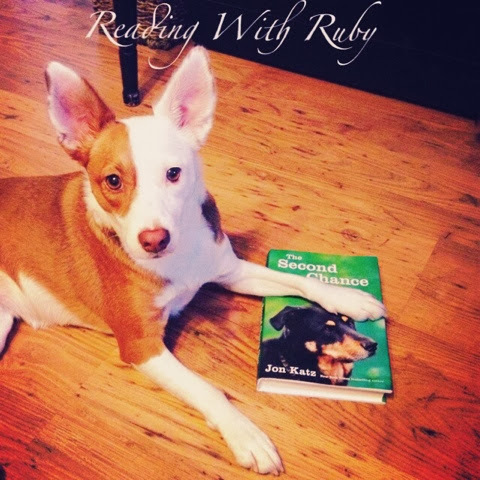 Ruby's reactive behavior did not become apparent until about a month after I adopted her, and early on I spent a lot of time blaming myself, thinking that I "ruined my dog" by overdoing it at the start with the dog park, doggie day care and group classes. Ruby was the youngest dog I've ever had and while I know we missed the critical socialization period by a long shot, I thought it would still do her good to be exposed to lots of different things. Now that I know her better, I realize that she was probably extremely shut-down and stressed out during that first month, and did not begin to exhibit her true personality until later. Her background is unknown, and coming from a high-kill shelter in Arkansas, it's not a stretch to guess that it probably wasn't good. 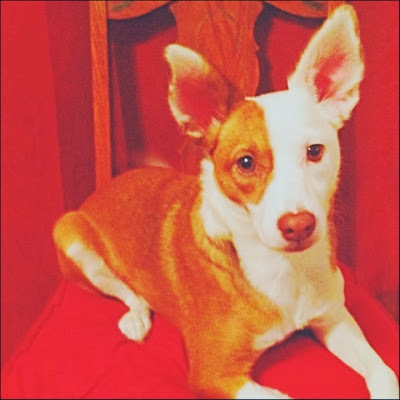 With herding breed and terrier in her make-up, both groups which can be prone to reactivity, and transitioning from puppy to adult, it is probably a complicated miasma of genetics and circumstance that make Ruby the dog she is. Luckily, or unluckily, she is not my first reactive dog, although she is less discriminating in her triggers than my late Norwegian Elkhound, Freya. After my initial panic, I buckled down to the work of management. I had several sessions with a professional trainer whose philosophies were in line with my own, I gathered all of the information I could about positive reinforcement training and assembled an arsenal of tools: calming music, Thundershirt products, various harnesses and head-collars, and the magical peanut butter bottle. It can all be overwhelming, but it's imperative to take things one day at a time. It will most likely be work that is never done. We haven't had any drastic improvements, and there have been inevitable ups and downs. No matter how careful you are to control the environment, the environment is not entirely within your control. What I do notice are little changes in Ruby: how she wags her tail more, how she can watch people walk by outside from the living room window (but still not dogs), how her body language is loose and relaxed when we get close to home after a walk. Ultimately, what has changed the most over the past five months are my own attitude and expectations. I love this dog. This dog is forever. What I want most for her is for her to feel calm and confident and happy and I'm going to do my best to protect her from the things that make her feel otherwise, and nurture the behavior that will help her cope. 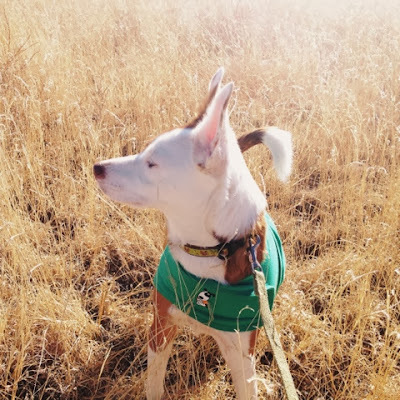 While I do wish we could have normal walks where I am not scanning the horizon for other dogs, suddenly changing direction to avoid a jogger or ducking behind cars in hopes that she won't notice the approaching cyclist, I've become more accepting of where we're at right now, and where our comfort zone is. Most importantly, I have patience with Ruby and with myself. If I'm not feeling up to high-caliber distraction tactics, we opt for a shorter walk in an area we are less likely to run into anyone. If we have a bad day, I try to reevaluate everything that happened, and what can be improved upon. Many reactive-dog-blogs I follow are, for all intents and purposes, on the other side, or at least several years in to the journey. They've successfully attended group classes or competed in agility. Ruby and I are a long way from such things, but I like to think they are possible. 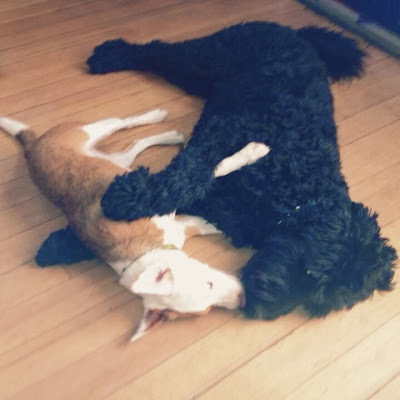 I wanted to tell the story of starting out, of looking our anxious, fearful, hyper-vigilant, sensitive dogs in the eyes and saying "we're in this together." I want this to be a place for hope, encouragement and commiseration. A place to share ideas and victories large and small, be it gaining a Canine Good Citizen Title or passing a stranger without barking. This is the beginning...the only logical place to start. 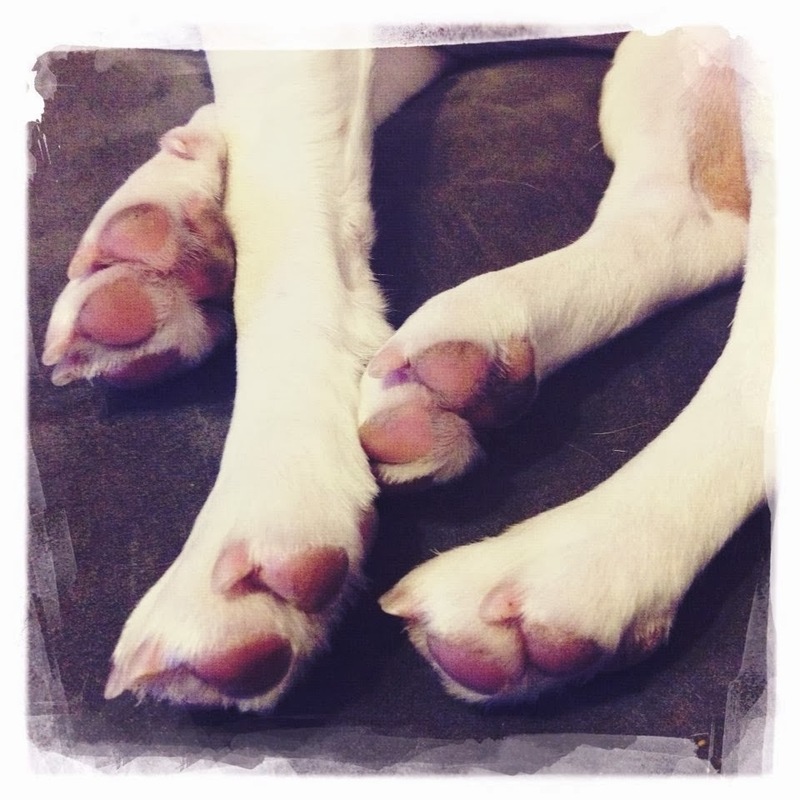 Reactivity is not a dirty word, it's more common than you probably think, and our complicated dogs have so much to teach us. I've read several Jon Katz books over the years, my favorite being The New Work of Dogs about our modern relationship with our best friend. 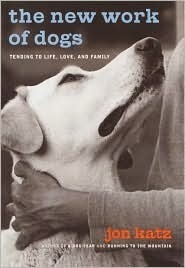 If I remember correctly, even when his own dogs were the subject, Katz did not get into many details about his personal or family life in previous books, and The Second Chance Dog is probably his most introspective to date, a story of love and redemption, of both dog and human conquering fear. While some people may not be as interested in the parts of the book that stray from the dogcentric, I enjoyed learning a bit more about Katz, his struggles with anxiety, and the beginnings of his relationship with Maria, whose Rottweiler/German Shepherd mix Frieda is the story's star. When Katz meets Frieda, she is spending most of her time in the studio barn with fiber artist, Maria, Katz's love interest. Frieda was in the shelter for a year before Maria adopted her, and Katz goes through considerable effort to piece together her heartbreaking past. Although she has bonded deeply with Maria, Frieda is frighteningly unfriendly to all other residents of Bedlam Farm: human, hooved, pawed and feathered. Katz makes Frieda his personal project, knowing that she will have to be integrated into farm life if he and Maria are to be together. He is obviously a great lover of animals, but Katz has a uniquely pragmatic philosophy about their role in our lives which has been met with some harsh judgment, particularly in regard to his Border Collie Orson as detailed in A Good Dog. He is a prolific blogger, branching out to subjects beyond dogs such as spirituality and homelessness. "We looked at each other for the longest time, and then I broke the silence and said, "I don't know what to do with you. I love you and want to live with you, but I am sad and frustrated. I've tried everything I can think of but what else can I do? What do want from me?" And then, without moving her lips or snout, without making a sound, Frieda spoke to me. This book was a Christmas gift from my boyfriend, who needs a clever alias. I gave The Second Chance Dog four stars on Goodreads. Dogs add such richness to our lives, and I can't think of a better way to spend a Sunday winter afternoon than curling up with a good dog book and a good dog. I'll be continuing this series and hope you'll share some of your favorites, too! "Relax" was one of the first tricks I taught Ruby. Sometimes she is so easy to work with that it's hard to describe exactly how I capture things. When I taught "roll over" and she got confused or just tired, she would stretch out flat on her side, so I just clicked/treated to reinforce that behavior and put it on cue. I use the clicker when training a new behavior, but phase it out pretty quickly. I will take a deep breath before I say "relax" and tilt my head to the left - she doesn't always need the verbal cue, but in this video you can see that she needed a little prompting. 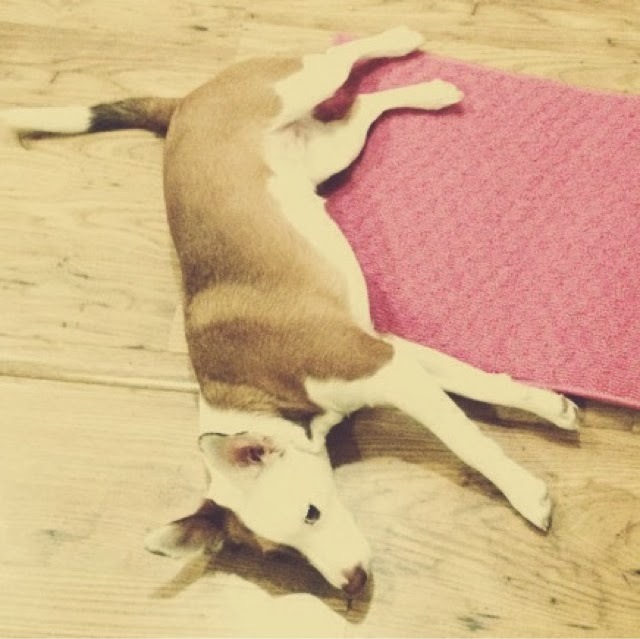 Since Ruby can be extremely high-energy and hyper-vigilant, and my main objectives in her training are calmness, confidence and self-control, I thought that learning to at least look relaxed could be beneficial. 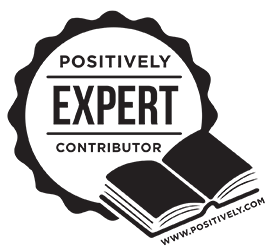 Here is a good article by Dr. Sophia Yin that explains how to train this behavior step-by-step and emphasizes its value. I used "relax" instead of "bang" or "play dead" because I don't even want to pantomime shooting my dog! I didn't notice until I took video how much her tail wags when she is doing tricks - I love that it's something we can both enjoy! 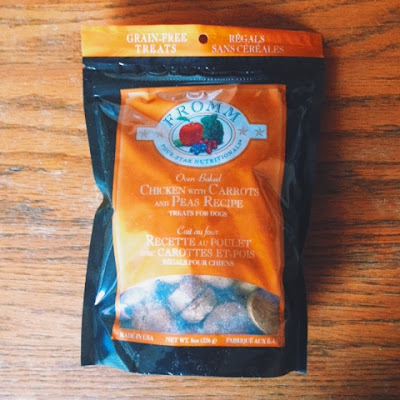 The nice folks at Chewy.com sent out these Fromm Grain Free treats in Chicken with Carrots and Peas flavor for us to review. I was very excited about trying them as Ruby's favorite food is the canned shredded beef entree from Fromm Family Foods. I like this company very much because they are made in the USA, have been around since 1949 according to their website, use quality ingredients and employ impressive safety standards. Their canned and dry foods also receive four- and five- star reviews on Dog Food Advisor. Ruby says "let's get this review on the road!" 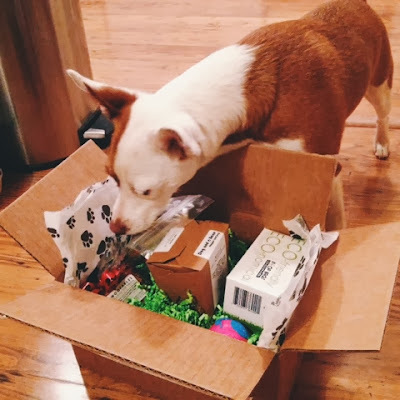 Ruby has gotten enough packages in the mail that she is excited to see any sort of parcel, and seemed to know that this one contained something good. 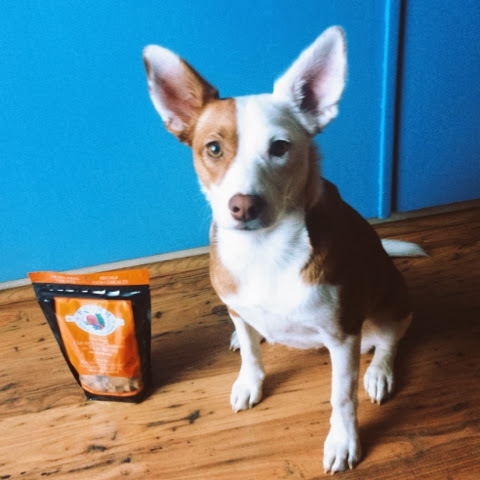 She helped me open the box, sniffing the orange package eagerly, then patiently sat through the modeling portion of the review process, though clearly ready to get to the taste testing! I consider these too large to use as a training treat (and rather difficult to break up) but they are the perfect size to make a great after-dinner biscuit or anytime snack. Ruby always gets a cookie for cleaning her plate and I think she would consider these a worthy dessert. I can feel good about these ingredients, and Ruby seemed to vouch for their tastiness. 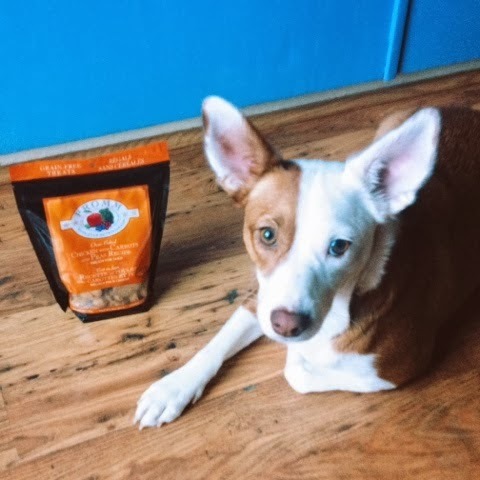 She has been known to be a little on the picky side when it comes to treats (it can't possibly be because I like to give her a wide variety of the very best...) but ate her first few samples of the Fromm treats enthusiastically, and even asked for more! She tends to leave a trail of crumbs like Hansel and Gretel, but these were so yummy that she made sure to clean every last speck off of the floor. Ruby rates them crumb-licking good! 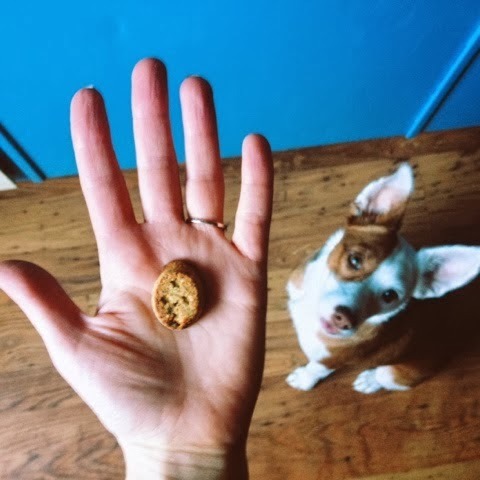 Fromm Grain Free treats are available through Chewy.com for only $4.99 for an 8 oz. bag, and some fat-free varieties are currently on sale. I know I will be making them a regular addition to Ruby's treat basket. DISCLAIMER: I received a full-sized package of Fromm Grain Free treats from Chewy.com in exchange for my honest review. In one of last week's posts I mentioned an unexpected trip to the vet hospital, and being thankful for pet insurance. That trip and Ruby's illness that prompted it was scary, but I'm happy to report that she recovered without incident and I've taken some extra precautions since then. The night before we rushed off to our local emergency clinic at 7:30 p.m., Ruby had swallowed a small piece of a plush toy - the "skin" if you will, she spits out the innards - probably not bigger than a quarter, and not for the first time. I have fished many a similar piece out of her mouth and thought I was fairly vigilant in supervising her plushie disemboweling, but clearly not vigilant enough. I didn't think a lot of it that evening - as I said, it was not the first time and things had "come out okay" before; however, when she began throwing up repeatedly the next night, my first frightening thought was "obstruction" and I was not going to mess around. Although she'd been groaning at home, Ruby perked up substantially at the clinic and charmed all of the staff. It's a place I became far too familiar with during my elkhound Freya's illness, and it was tough to be back there, this time worrying that my new little girl could possibly require surgery. After a precursory exam, the vet took Ruby back for x-rays, and it was a huge relief when the radiology report came back with no major findings. They administered some anti-vomiting medication and some subcutaneous fluids, then sent us home. I was advised to keep her on a bland diet and watch for any other signs of illness, but they expected she would be just fine, which she was. This incident prompted a revision of our toy policy and the discarding or re-homing of most of her plush toys. I kept only two that had not been damaged, and those along with tug toys are kept in her now seldom-used crate, re-purposed into "toy jail" and brought out only for closely supervised play sessions. I've phased out the rope tugs as they tend to unravel and shed so quickly, and switched to the Walk-e-Woo TugGRRR which is made locally here in Colorado and which is holding up superbly so far. While it does have fur in the middle, the main tugging part is nylon webbing, and Ruby goes absolutely nuts for it, which I'll talk about next. She has a selection of balls and durable rubber toys (our favorite by far still being the Hide-A-Squirrel Extreme) out at all times when I'm home, and nothing but an occasional stuffed Kong in the kitchen when I'm gone. I got her a new toy at Kriser's this weekend - a seemingly tough silicone newt - which lost a limb within minutes. The limb was recovered, the cute newt tossed. It astounds me that there are so many toys on the market that appear they would only be appropriate for a toothless dog. What toys and tugs have you found that stand up to jaws and claws? As for tugging...it's become not only our go-to energy-burning game played several times a day, but an extremely useful training platform, and a motivation equal if not greater than high-value treats! I used "training within the game" to teach Ruby's "spin" to the right, and we're pretty close to nailing "twirl" to the left. I ask her to jump up on the sofa and back down with a sort of "schew"-sounding cue, and can't help but think this would translate perfectly to the flyball box if we ever pursued that sport. My training goal for this month, also in light of the toy-gulping incident, was to work on a reliable "drop it," and I'm delighted to say that is coming along really well with the tug. I've successfully recovered a few stolen socks and last night, a pilfered blackberry (safe for dogs but I wanted to test out the command on a food item). I ask for various commands in between tugging rounds, such as "relax," "roll over" and sequences of the aforementioned "spin" and "twirl," and I was thrilled when I was able to take the tug, ask for a "down," drop the tug on my feet in front of Ruby with a "leave it" command, and never lose her eye contact. I'm noticing her self-control improve immensely, and while she does still get carried away once in a while (which results in "Game Over" and the tug going back to toy jail) this is happening less and less. I'm anxious to try taking the tug out with us, on walks or to the park, and see if it can be a viable distraction/reward for her trigger managing. It's wonderful to have a play and training tool that she obviously enjoys so much. 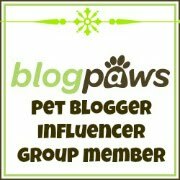 I'd like to take a moment to welcome our new followers - I am ridiculously giddy whenever I see a new faces and comments as I think one of the most exciting aspects of blogging is meeting fellow pet lovers and sharing experiences and ideas. Since Ruby and I spend part of most weekends curled up on the sofa with a book, I've decided to combine my passion for reading and dogs and start including book reviews here - watch for the first one coming soon! This is the point where love, the very beginning of love, shades right out of language's grasp. Some constellation of image and gesture, some quality of soul, something charmed and promised. Maybe we should be glad, finally, that the word can't go where the heart can, not completely. It's freeing, to think there's always an aspect of us outside the grasp of speech, the common stuff of language. Love is common, too, absolutely so - and yet our words for it only point to it; they do not describe it. They are indicators of something immense: the word love is merely a sign that means something like this way to the mountain. 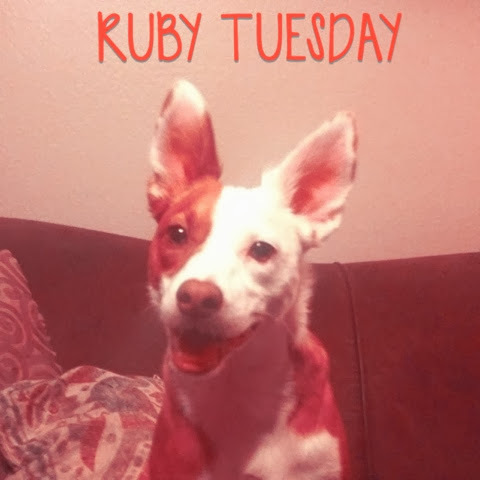 I talk to Ruby a lot, often in a high-pitched voice that I did not use with my big dogs. I talk to her about what we're doing, what we're going to do, who is coming over. I tell her about Lasya and Freya and that I wish my mom could have met her. She listens with an endearing attentiveness, sometimes with a devastatingly adorable head-tilt. With ears like hers, you can't help but believe she takes in every word. Her seeming comprehension of what I say grows every day. 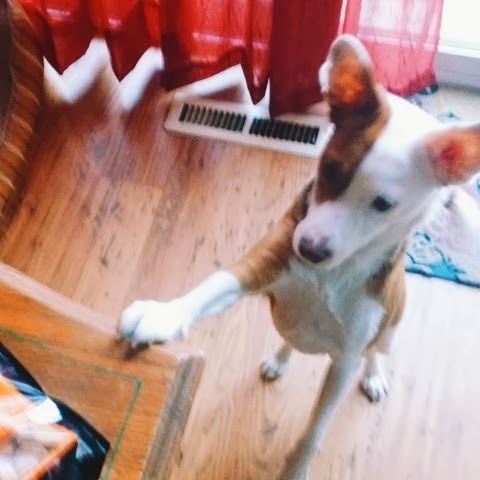 I keep a lengthening list of her understood commands, but that doesn't begin to cover the words and phrases that she seems to recognize, such as "Nina," "cookie," "kitchen," "want to play tug?" "time for bed," and of course "walk." I tell her she is good, she is clever, she is tough, she is amazing, I say 'what a girl!" There is no shortage of conversation and praise; however, I notice that I don't regularly tell her that I love her, and not for lack of truth or meaning behind it. 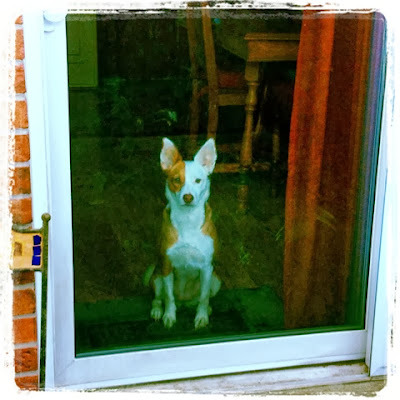 One of the greatest qualities I admire in dogs and all animals is nonverbal communication. I appreciate deeply the way they talk with their bodies in a way that we usually have too many reservations about. They bump against each other as they trot a long side by side, they full-body-wag when they are happy to see us or each-other, they gaze with an unnerving penetration and they kiss unabashedly on the mouth. They have no words for "I love you" and yet we never doubt it. In the verbal cacophony of the human world, I think the words are sometimes dispensed too easily, or under obligation or rote. They are sometimes lost to distraction, a bad connection of technology or emotion. When love is unspoken, it is at its most pure. Its adoring actions have an unmistakable volume. I suppose I have always felt with my cats, horses and dogs, that love is a hand on a flank as they sleep, love is a cheek leaned against a soft head, love is a wild game of tug even when I'm tired, and an amused resignation to being licked enthusiastically on the chin. 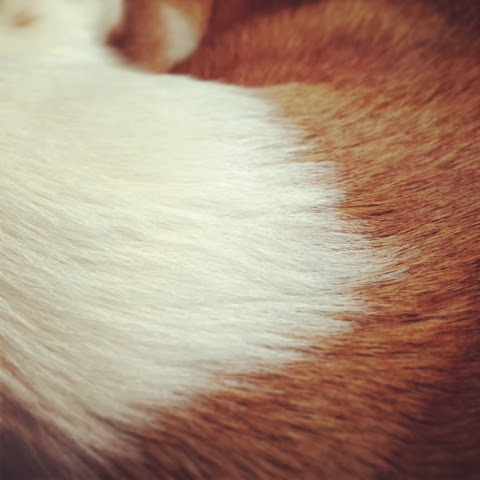 It's in the way I can gaze endlessly at the greenish-gold mosaics of Ruby's eyes, the freckled backs of her ears or the end of her tail that looks like a white-dipped paintbrush. The word is a marker, something I can say to others about my dog, which they may or not understand, but for Ruby, for this dazzling dog that has a terrier's hold and a herder's attention on my heart, love is a whole wilderness that doesn't need signs. I think that Throwback Thursdays are the perfect opportunity to write about dogs I've known and loved through the years. 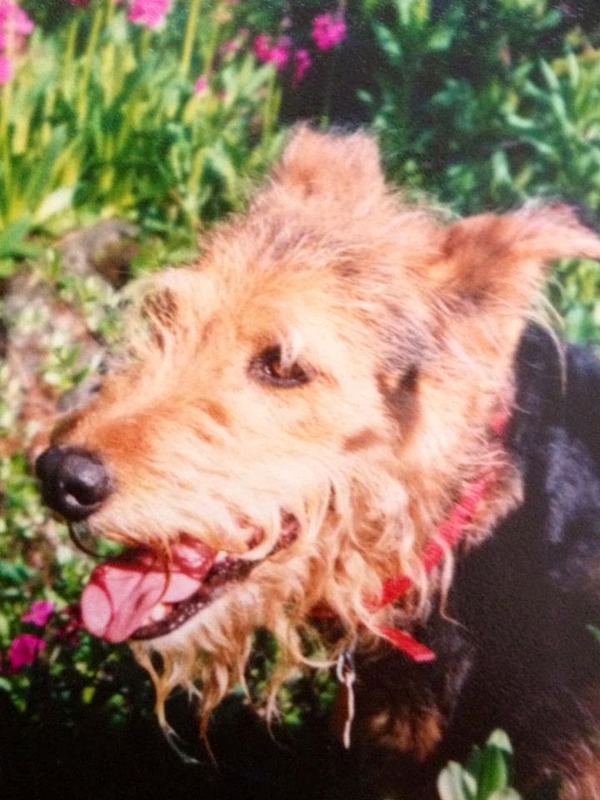 Scout was our last family dog, chosen by my mom from the Santa Fe animal shelter after a trip to an Airedale "breeder" that turned out to be a puppy mill. 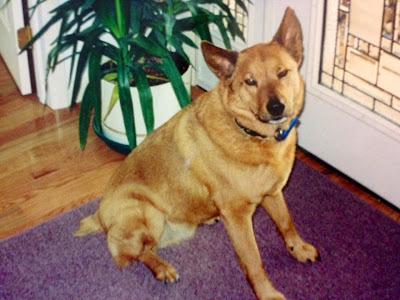 A New Mexican mutt, probably part cattle dog, Scout was a smart, extraordinary boy. For most of his life he got to run free on forty acres that he knew was his own, accompanying us on trail rides, chasing rabbits, and going for eventful trips to town. He visited Denver often with my mom, not altogether loving the city dog's life on a leash, but enjoying sleeping on the day bed and playing with his cousins. They made such a beautiful, tri-colored trio. He was never very fond of Freya and merely tolerated her, although I think she admired him like the cool guy in town, but he and Lasya had a special bond, having known each other since he was just a puppy. She was with him for the first few weeks and would let the ruddy butterball puppy take food right out of her mouth. 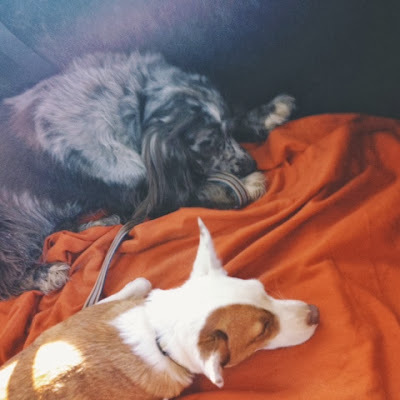 They were inseparable when we'd visit Mancos for the holidays. He got to take a road trip to Northern California after my mom finished the first round of chemo - they stayed in hotels all along the coast and Scout got his first look at the ocean. My dad, who initially thought it would be a hassle to vacation with a dog, said it was the best trip they ever took. I don't think I got many emails from my mother over the years that did not include a mention of her Scoutie, and their plans for the day. 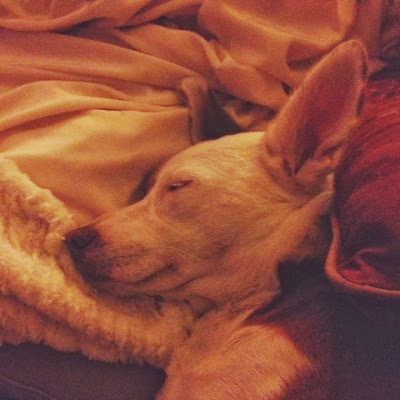 Scout was special in so many ways, but he had an uncanny affinity for music. He loved to howl along with my dad's harmonica playing, and had very distinct preferences when it came to CDs. He could never resist harmonica, but he also enjoyed saxophone and muted trumpet. There were certain songs he would sing to that didn't fit any of his usual tastes, but he would sit down and throw his head back to harmonize whenever they came on: "Beautiful Blue Bird" by Neil Young, "Lucky" by Radiohead, and "Many Meetings" from Lord of the Rings when I would play it on piano. When he sang he would seem almost embarrassed, like he couldn't help himself, but would also look for your reaction when he was finished. We lost Scout in 2012 to cancer about two years after losing my mother to the same. I don't know that my dad will get another dog, but he seems to enjoy Ruby when he visits and dog-sits for me. I considered calling Ruby "Finch" as an homage to Scout, since his name was from To Kill A Mockingbird, and I still think it's a fantastic name for perhaps another dog down the road.